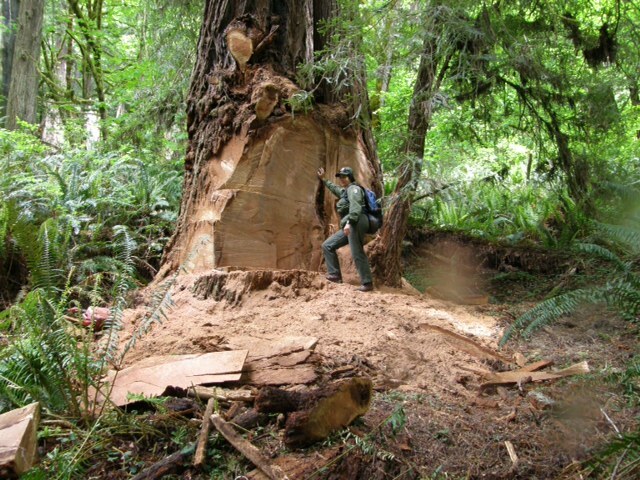 A ranger stands near a damaged coast redwood that lost its burl to poachers this week at Prairie Creek Redwoods State Park. Photo by Marshall Neeck. Last year, I saw a man ride a bicycle down the road from Ladybird Johnson Grove in Prairie Creek Redwoods State Park carrying a large chainsaw. I was baffled at the sight and now realize just how terrible an omen this was. It’s hard to imagine how anyone could enter the cathedral-like groves at Redwood National and State Parks (RNSP) and steal wood from an ancient and spectacular redwood. Unfortunately, we are forced to imagine it because burl poaching is happening in our parks. Last month, a 300-year-old redwood was cut down at RNSP so that the thieves could cut off a burl that was growing 5o feet up on the tall redwood’s trunk. Again this week, an old redwood was attacked and this time the base of the large redwood was deeply cut to remove the burl wood near the Tall Trees Trail along Redwood Creek at RNSP. Apparently, there is still a market for marbled burl wood which is used to create a variety of wooden products. The act of cutting burls off a redwood damages the tree by weakening the trunk base, making it vulnerable to disease and rot, and reducing its ability to reproduce by basal sprouts. We can use DNA sequencing to trace burl wood to the source tree, so consumers of burl products should think twice before supporting this industry that may be using illegally obtained wood. Please help us catch the thieves and contact Redwood National and State Parks at (707) 465-7335 if you have information about this recent crime.